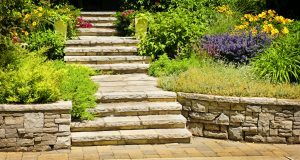 Landscaping Service Ft. Collins: What Can We Do for Your Home This Summer? With the hottest days of the summer coming up quickly, you’ve probably turned on your sprinklers and started preparing your backyard for summer barbeques and family gatherings. At Advanced Landscaping & Sprinklers Inc., we know that it can be hard to find the time for landscaping with all of the fun activities the warm weather brings. Between working, spending time with your family, and enjoying the beautiful scenery that Colorado has to offer, lawn maintenance and fence installations are probably the last things on your to-do list. Advanced Landscaping & Sprinklers Inc. is proud to be the Top Rated Local® landscaping company in Fort Collins, and in today’s post, we’ll provide you with a brief overview of the landscaping and lawn care services we offer. Continue reading to learn more, and give our landscapers a call today for a free quote! The landscape that frames your home makes a statement, and you should always want it to be one that reflects positively on you and your family. If you’re looking for a way to increase your home’s resale value and curb appeal simultaneously, then you should think about investing in a landscape installation. Our landscapers have helped hundreds of Fort Collins residents create the landscape of their dreams, and we can do everything from water feature installations to retaining wall construction. If your home already has a gorgeous landscape design, we can help you make the most of it and allow you to spend more time with your friends and family. Our professional landscapers can provide you with regularly scheduled lawn maintenance, weeding, shrub pruning trimming, and more! You’re not alone if you’re tired of watering your lawn by hand. You probably have to set a timer when you turn on your manual sprinkler, and if you have a large yard, you could be spending several hours each week keeping up with the demands of your lawn. Moreover, you may be over-watering and adding a significant amount of money to your monthly utility bills. Advanced Landscaping & Sprinklers Inc. offers irrigation installations that can make watering your lawn easy and effortless. Our landscapers will create a custom sprinkler system for your yard that delivers the exact amount of water your lawn needs to look luscious and vibrant throughout the summer. Do you enjoy summer gardening? We can help with that, too! Our automatic drip systems and sprinklers can be installed around a garden and programmed to give your plants the water they need to thrive. We hope that this post will inspire you to give our landscapers a call for your landscaping and irrigation needs this summer. Whether you’re thinking about adding a gorgeous new patio as part of a backyard landscaping project or you just need a bit of help mowing your lawn twice a week, we’re the landscaping company to call! Keep an eye out for future posts in which we’ll continue to highlight and explain the landscaping services we offer. Get in touch with us by phone or by email to schedule a free quote — we look forward to working with you soon!